Have you ever drawn a Life Balance Wheel? You know…where you make a circle, add some spokes, and write all the primary areas of your life in the spaces? The intention of this exercise is to realize where you’re out of balance and what areas of your life need some adjustments. It’s a good visual, but is it an accurate picture of how life works? Is it that static? Can we ever obtain balance…and do we really want to? Can God be moved from the center? Are we in control of His position? When I direct all of my time and energy on something…like writing a book…and rarely give God a moment’s thought, have I God moved from the center of my life wheel because my current focus seems to be the hub around which my life revolves? Does He compete with all the other things in my life? Can another person or activity replace God there? I remember (way back!) in college when all I could think about was my boyfriend, and I felt great guilt for not making God the center of my life. But, I liked the guy and he captured my interest. Is the measurement of what occupies the center of our wheel that to which we give the most attention? Are things interchangeable with God? Or are we at the center of God’s purposes rather than God being at the center of ours? 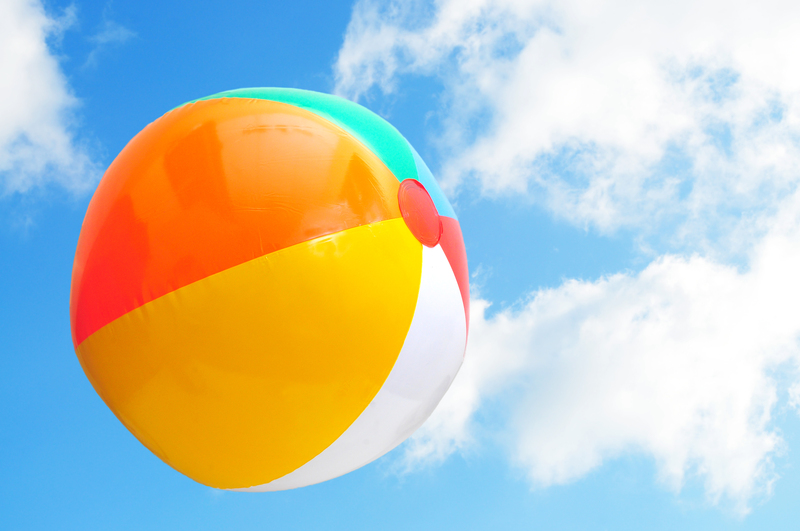 Visualize a different item…a beach ball. It’s similar to a wheel in that it has sections, and each of our priorities and activities could be written on these segments in the same way. But, a beach ball is three-dimensional, has a valve, and is buoyant when it’s filled up. Could it be that our multi-dimensional lives are suspended in the vastness of God’s Love? Are we surrounded and supported by His unlimited Presence? Is the trajectory of our life determined by the loving hands of a God who ‘volleys’ us in the direction where we will find the most fulfillment…where we will become the person He had in mind when He created us? I believe so! Imagine freely floating in the atmosphere of God’s Love…in the center of His purposes! How might we look at our lives in a different way? God is only limited by how open we are. Consider the valve on the beach ball…the place where breath enters to blow it up. This valve has to be open in order for air to fill the space inside. In the same way, God fills us…but He waits for an opening…any opening. When there is one, He rushes in to fill it with His Breath, His Spirit, His Love. The only thing we control is the valve…the opening of ourselves to God and inviting Him to fill our empty spaces. The more we are open, the more we experience His Presence. When God fills us, we are more buoyant. An inflated beach ball is buoyant. Buoyancy is defined as: 1) the ability or tendency to float, and 2) a relative lightness or resilience of spirit. How might this apply to me…to you? When we’re inflated by God’s Spirit, we can enjoy a lightness, a resilience, even though the segments of our lives may be challenging, burdensome, and needing our focused attention. As we open the valve of our inner life more and more to His Love and Presence, we grow in the ability to ‘float freely’ in whatever priorities and circumstances make up our ‘life wheel.’ It’s a gift of grace to live this way. Aware of being suspended and surrounded by the atmosphere of God’s Love. Being in the center of His holy purposes. Open to God and inflated by His Spirit, with empty inner spaces filled up by Him. Light, buoyant, and resilient in all the areas of life. Floating free and enjoying the ride! That’s how I want to be…more and more. How about you? Love this metaphor. I REALLY LOVE this metaphor. So inviting! OOOhhhhh, empty, empty me of me…fill me, fill me with His Spirit. I will credit you for this great visual. Think I will add a beach ball to my office! Great Metaphor Marilyn!!! This old 8 needs more buoyancy and lightheartedness!! I love this illustration, Marilyn! My sister and I are wanting to come to your event in TN. Is that still happening? I haven’t found it to sign up. Loved seeing and hearing you in VA.
As a 5 who has difficulty moving out of my own head space, and feeling some guilt about it, this speaks to my soul. I have been really struggling lately with where God fits into my life but to hear instead that He is all around it, infusing every part of my being and my life with His presence- it just feels right to me – and it is so freeing. I’m looking forward to seeing how this knowledge brings lightness and freedom to my everyday. Thank you for this insightful. I’m new to this study and intrigued. As a 4 I love the visual of the beach ball and I love Jehovah God and his son. As a 4 i love to create as I imitate my Creator!